I am at the EAGE Conference & Exhibition in Copenhagen. Yesterday I wrote up my highlights from Day 2. Today it's, yep, Day 3! Amusingly, and depressingly, the highlight of the morning was the accidental five minute gap between talks in the land seismic acquisition session. Ralf Ferber and Felix Herrmann began spontaneously debating the sparsity of seismic data (Ferber doubting it, Herrmann convinced of it), and there was a palpable energy in the room. I know from experience that it is difficult to start conversations like this on purpose, but conferences need more of this. There was some good stuff in Ralf's two talks as well. I am getting out of my depth when it comes to non-uniform sampling (and the related concept of compressive sensing), but I am a closet signal analyst and I get a kick out of trying to follow along. The main idea is that you want to break aliasing, a type of coherent noise and a harmful artifact, arising from regular sampling (right). The way to break it is to introduce randomness and irregularity—essentially to deliberately introduce errors in the data. Ralf's paper suggested randomly reversing the polarity of receivers, but there are other ways. The trick is that we know what errors we introduced. 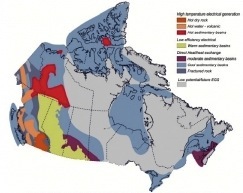 Geothermal in Canada. Image: GSC. As Evan mentioned recently, we've been doing a lot of interpretation on geothermal projects recently. And we both worked in the past on oil sands projects. Today I saw a new world of possiblity open up as Simon Weides of GFZ Potsdam gave his paper, Geothermal exploration of Paleozoic formations in central Alberta, Canada. He has assessed two areas: the Edmonton Peace River regions, but only described the former today. While not hot enough for electricity generation, the temperature in the Cambrian (81°–89°C) is suitable for so-called district heating projects, though it's so tight it would need fraccing. The Devonian is cooler, at 36°–59°C, but still potentially useful for greenhouses and domestic heat. The industrial applications in Alberta, where drilling is easy and inexpensive, are manifold. Perhaps we don't need the science of signals, but the science of noise. The science of noise is the science of things we don't understand, and that is the best kind of science. Yes! We, as scientists in the service of man, must get better at thinking about, worrying about, and talking about the things we don't understand. If I was feeling provocative, I might even say this: the things we understand are boring. 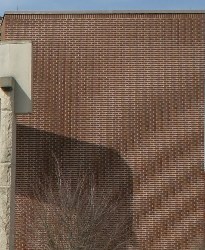 The brick image shows spatial aliasing resulting from poor sampling. Source: Wikipedian cburnett, under GFDL.